Blog Too small for internal communication? Too small for internal communication? I have often heard it said that small organisations do not need to think about internal communication. Whilst it may be true that smaller organisations have different internal comms needs and challenges to larger ones, as soon as you have more than one person in a room you will require some level of communication with each other. It’s just that the solutions to any challenges that arise are likely to be slightly different. During my career I have worked with organisations of all different shapes and sizes. These have included large national charities, large universities, medium-sized international charities and small organisations such as a local membership charity and an education charity with 4 employees and national reach. They have all been facing problems that we solved together by improving communication. One of the keys to successful internal communication is ensuring that everyone understands the overall direction of the organisation and how their work fits in. Why is it important that they are doing their bit? It is just as important to build this understanding if there are 3 of you as it is if there are 3,000 employees. In my experience it is sometimes the case that people in a small organisation assume everyone else knows who is doing what and why, when in fact they don’t. When there is only a handful of you keeping the organisation going, you can easily become too busy to pay attention to everyone else’s work. Methods of communication may be easier if you are smaller in number. You don’t need to be using Yammer to ask for suggestions of how to find sponsors for an event if you can simply turn your chair round and ask your colleague across the room. And it should be easier to have a chat about how to process a payment while the kettle boils than to look it up on the intranet. You do still need to have a discussion about the best methods of communication to use for your organisation: for example, some people prefer not to be interrupted by constant questions, whilst others find it useful to use a whiteboard to capture key messages for the whole team. Of course, if there are only a few of you in the organisation but you are based in different locations, things get trickier. One organisation I worked with was experiencing difficulties with communication between employees because it had grown extremely rapidly from 5 people to over 100. The methods they had previously relied on to keep each other informed were no longer viable. As a result, some people knew what was going on, some didn’t and there was an office-wide feeling of resentment: ‘they aren’t communicating with me’. 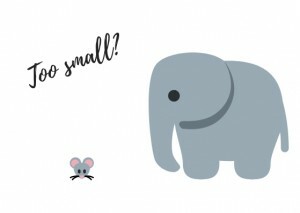 This illustrates the importance of taking time to think about your communication when you’re small – you may not have time to think about it when you are going through rapid growth. Having a good foundation in place will stand you in good stead in the future. So if you’re a small organisation, what should you be thinking about in terms of communication? Whatever size organisation you are, it’s important to understand why effective communication is important for you and how it will contribute to your overall aims. For example, sharing information on current funding levels or number of people waiting for your service will help you to plan what you deliver, for whom and when. Have a clear plan of the methods you will use, based on where you each work. Take working patterns into account too. For example, very small organisations will often have part-time workers, so you might not all be in the office at the same time. If you’re going to communicate via regular face to face conversations, how will you include those who aren’t in the office that day? Actively remind yourself to communicate regularly and effectively. It can be easy to get caught up in the day to day delivery of your organisation’s mission and forget to communicate with each other. Whatever size your organisation is, being clear on how communication works for you should be one of your first priorities. If you need help in identifying what you need, please get in touch.